"The Tenth Regiment of Foot, American Contingent carried two sets of Colours during the American Bicentennial celebration from 1971 to 1978. As in the 18th century, there was an embroidered set and a painted set of Colours." The custom of carrying some form of distinguishing emblem as a rallying point in battle is a very old one. The earliest form appears to have been a bundle of hay attached to a pole. Later the Roman legions carried the Roman Eagle, each manipule (company) having its own ensign. From these early emblems the present type of Colour evolved, and though no longer carried by the British Army in action, they remain as the visible symbols of loyalty to the Crown and the spirit and traditions of the Regiment. During the seventeenth century regiments had as many as ten or twelve Colours, these being in the nature of private banners with the Colonels’ and company commanders’ own armorial bearings worked thereon. In the reign of William III, Colours were reduced from one per company to three per regiment. A Royal Warrant of 1743 introduced two Colours of completely different style. The first was the Great Union, the second of the same colour as the Regiment’s facings. 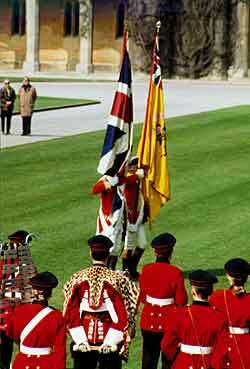 By a warrant of 1751, the former was named the King’s Colour, the latter the Regimental Colour. The Tenth Regiment of Foot, American Contingent carried two sets of Colours during the American Bicentennial celebration from 1971 to 1978. As in the 18th century, there was an embroidered set and a painted set of Colours. The embroidered Regimental Colour was presented to the American Contingent by the British Consul-General of Boston, Mrs. Lenore Storer in April 1971. It was made of super lute silk by Hobson’s in London. In a ceremony in Chelmsford, Massachusetts on 20 April 1975, The King’s Colour was presented by Major General Sir Christopher Welby-Everard, KBE, CB, DL. To create this silk colour, the Royal School of Needlework used a technique called passing-through embroidery in order to make the detail the same on both sides of the Colour. A rose took two women four days to accomplish. Major General Douglas Brown, RA, who was the moving force behind the famous Project Overlord Panels, helped to secure the aid of the Royal School of Needlework in London. 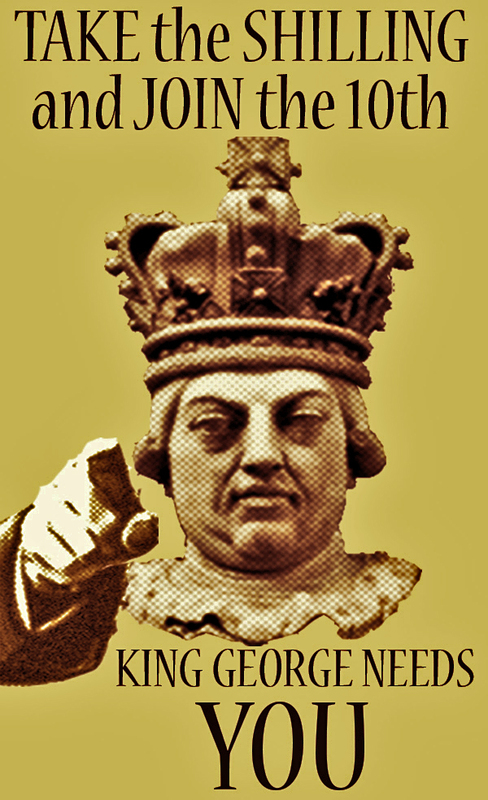 Every facet of the design of the King's Colour was checked by Major Nicholas Dawnay, the leading authority on British Colours . A Colour of the 12th Foot in the Officers' Mess at Bassingborn Barracks was viewed through the courtesy of Major Ronald Baylis, Quartermaster of the Royal Anglian Regiment, as an example of the period style as no 10th Foot Colours of that time exist. On Sunday 25 September 1979, the King's Colour of the American Contingent was displayed at the Altar of the Regimental Service and Church Parade during the Regimental Reunion in Cleethorpes, attended by Her Royal Highness, Princess Alice, the Duchess of Gloucester. After the drafting of the American Contingent, Colonel Vincent J-R Kehoe presented the two American Contingent Colours to the 10th Foot Royal Lincolnshire Regimental Association for the Museum at Sobraon Barracks in Lincoln. 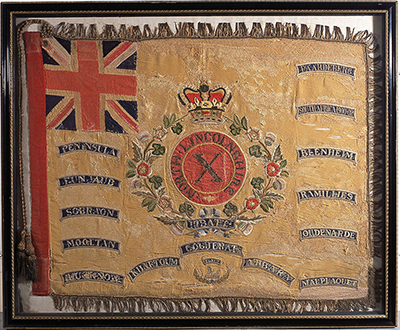 When the Regimental Museum was closed the Colours were transferred to the Museum of Lincolnshire Life. On 10 February 1992 (Sobraon Day), Col Kehoe requested the Trustees of the Royal Lincolnshire Regimental Association to release the Colours to His Majesty's 10th Regiment of Foot, in America. Permission was granted and arrangements were made for a two-part colour ceremony in 1993. The first part occurred on 15 April when the Colours were paraded to Lincoln Castle. On parade were members of the Royal Lincolnshire Regiment Old Comrades, the Royal British Legion and the Army Cadet Band. Maj. Gen. REJ Gerrard-Wright CB CBE DL, as President of the 10th Foot Royal Lincolnshire Regimental Association, handed the colours over to Lieutenant Colonel Richard E. Amsterdam and Lieutenant Christopher Smick of the American Contingent. 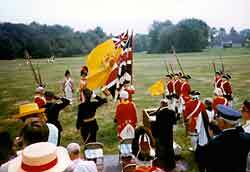 On 28 August 1993, before a crowd of several hundred observers, the original colours of the American Contingent were re-presented by Major General REJ Gerrard-Wright at Hanscom Air Force Base in Concord, Massachuetts. To the right, we see the colours parading before the saluting base. Taking the salute are Col Vincent J-R Kehoe, Major General REJ Gerrard Wright and Lieut R Wooddisse, ADC. As in the 18th century, the 10th Music was playing the slow march Scipio (Handel - 1726). It is played to this day at the Trooping of The Colour Ceremony at Horseguards on Colours March Past Reviewing Stand for the Queen's Birthday parade.